Similar to the Sherpa BW2, but with the added features of a built-in clinometer, luminous bezel, and an all-new declination adjustment method. Now the inner ring can be set to your current declination -- making super-easy adjusted readings. 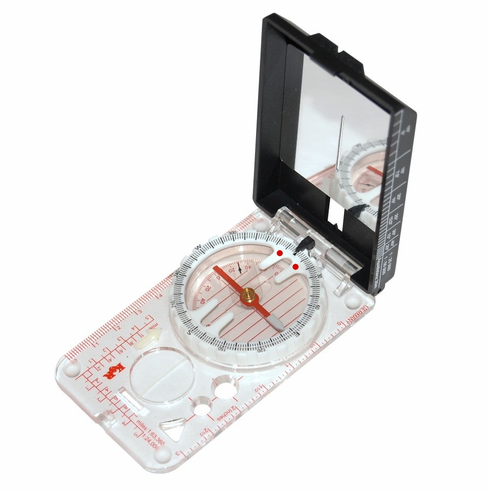 Tested and developed in cooperation the BRK Mountain Rescue Service, this precision compass from K&R was built with durability in mind. What really separates the Alpin from the rest of the mirror sighting field is the thermo-elastic fluid filled capsule and the solid metal mirror (polished aluminum). And since the sighting mirror is made of solid metal housed in a durable ABS lid -- there is no fragile glass or plexiglass to crack or break. This is truly a work-horse with precision accuracy. If your declination is Easterly (+), then rotate the inside ring clockwise (while holding the outside ring steady) and set the inside ring arrow on your declination value. Rotate in the opposite direction for Westerly (-) declination values. Now to take your bearing just line the needle up with the inside ring arrow (the red dot side of the "house").